DO-17003-00 was succesfully added to your cart. Regardless of the type of thermometry probe your application requires, InnoCal can ensure the accuracy of your meter, probe, or system! Calibrations on temperature systems (meter and probe) are performed using direct comparison in high-stability liquid using high-precision and SPRT’s and displays. Measurements can be performed at four points between -197C and 1300C. Points are generally selected at standard ITS-90 points across the range of the probe but customer-specified points can be accommodated. Calibrating the probe and meter together produces the highest accuracies. .Calibrations on bi-metal thermometers are performed using direct comparison in high-stability liquid and dry baths using high-precision PRT’s and SPRT’s and displays. Measurements can be performed at four points between -197°C and 1300°C. Points are generally selected at standard ITS-90 points across the range of the thermometer but customer-specified points can be accommodated. If I have two min/max thermometers, will I need two NIST-Traceable Calibrations? Or can I just use one for both? Thank you! One calibration service is required for each instrument e.g. calibration of two thermometers would require 2x 17003-00 be ordered. do you provide standars and expiration dates on the cert? 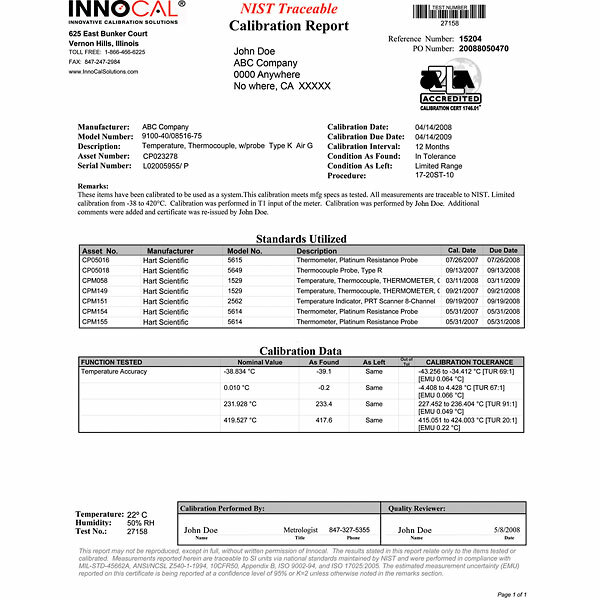 The NIST-traceable cert will indicate both the standards which have been used, and the calibration due date (nominally one year) of the certification. To satisfy our ISO/AS Quality System requirements, we are required to use NIST certified instruments. This satisfies all the requirements and keeps us compliant.